It’s as American as apple pie: dropping a fishing line in a still pond or casting into a fast moving stream. Fishing is a wonderful combination of sport, art and the chance to enjoy nature alone or with family and friends. At Sterling Ridge Resort and Log Cabins, the opportunities to enjoy the many facets of fishing in Vermont are almost limitless, and right outside the door of your beautiful log cabin. We love seeing one generation passing their love of fishing onto the next generation. Sterling Ridge Resort offers a beautiful, unspoiled pond right on our property for fishing. Many of our cozy cabins offer views of our tranquil Pond. 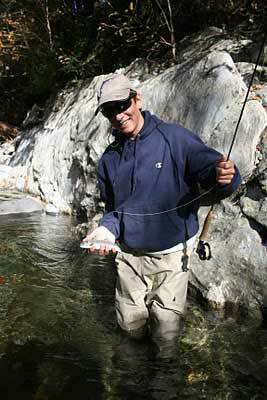 The nearby Lamoille River is a favorite for fly fishing and is renowned for its plentiful rainbow trout. Our area is an angler’s paradise! Families can learn together or improve their skills with one of Green Mountain Troutfitters guided tours. They offer scheduled tours and will tailor a private tour if that’s your preference. You can bring your own fly rod to perfect (or learn) your casting technique or the Troutfitters can provide you with the rods, reels and wading gear you need. The excursions are offered for all skill levels and explore some of Northern Vermont’s pristine trout streams, among the most scenic in New England! If instead of trout, you’re all about that bass (with apologies to Meghan Trainor), Vermont’s lakes and reservoirs are perfect for bass fishing! All participants over the age of 15 are required to have a valid Vermont Fishing license. The Troutfitters also offer fly fishing clinics and classes to learn the time-honored and fascinating tradition of fly tying, either with a group or private classes. Green Mountain Troutfitters proudly offers flies with patterns tied only in Vermont. Fly tying is truly an art form and each pattern has its own unique story! Whether you are new at fly fishing or an old hand; whether you prefer the solace of fishing alone or the camaraderie of fishing with friends and family; you are sure to get hooked on this wonderful sport! You’ll look forward to your spring trips to Sterling Ridge, and putting a sign on your cabin door that reads, “Gone Fishin’”!